Dogodna lokalizacja, światło, przestrzeń, dwie łazienki i widoki. W samym sercu dzielnicy Baixa, Chiado, patrząc na skąpanej w świetle, przestronny salon uwiedzie można po długich spacerów w kierunku rzeki Tag i Castelo zobaczysz z balkonu. Dostęp go z lotniska jest proste: dwie stacje metra i autobus w ciągu 5 minut. Restauracje, muzea, obsługa, wszystko jest na wyciągnięcie ręki. Dwie sypialnie, w tym pakietu głównego, w pełni wyposażoną kuchnię, klimatyzację, dźwiękoszczelne doskonałe i przestronnej stonowanym wystroju. Jest to idealne miejsce do przechowywania bagażu, nawet jeśli w końcu będzie można spędzić najbardziej beztroskie w mieście siedmiu wzgórzach, pięknej Lizbony. The flat was very clean and central located. Everything necessary was there to find and we recieved a wonderful arrival. 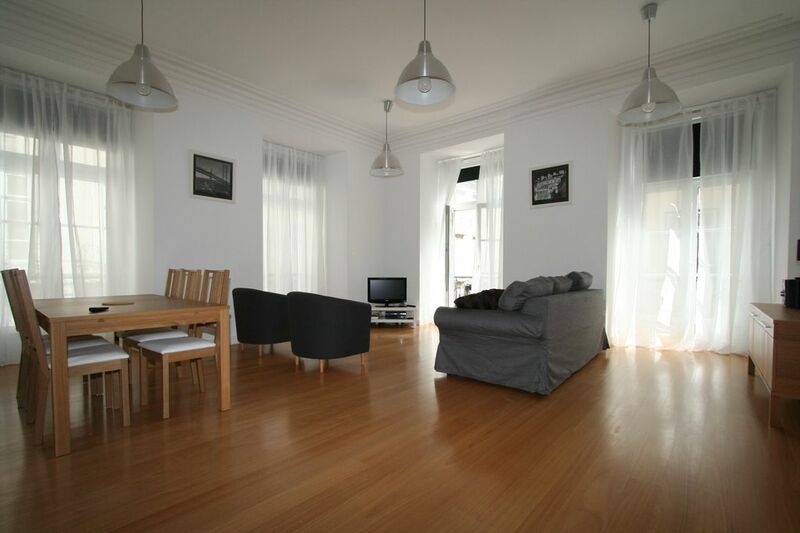 This apartment is very spacious and modern and comes equipped with all the necessities you need. Although, we did not meet the host personally she was only a text message away. The location was perfect. From the balcony you have views of Santa Justa elevator and São Jorge Castle. A bakery and a restaurant are located right at your front door. The address is very easy if you intend on using Uber for distances and if not the metro and teams are near. Overall, it was a wonderful stay in Lisbon and the apartment was perfect. Lovely, large bright space. 2 good sized bedrooms each with their own full bathroom. Comfortable beds, well appointed kitchen with both washer and dryer as well as the usual large and small appliances. And the location is superb. It is situated at the foot of the Santa Justa elevator and close to so many sites and public transit routes in old Lisbon. A unique feature is walking g through a small hat shop to get to the stairs that lead to the apartment. The apartment is comfortable, well appointed and conveniently located to the trams, yellow hop on hop off buses, taxis, restaurants, the waterfront, shopping, you name it, it is close by. It was perfect for the four of us. Contacting Anna was easy and quick for additional information. Entering through the "hat shop" adds to its character. A great big thank you to our host.